Poster of the Week: Where is this bower beside the silver Thames? 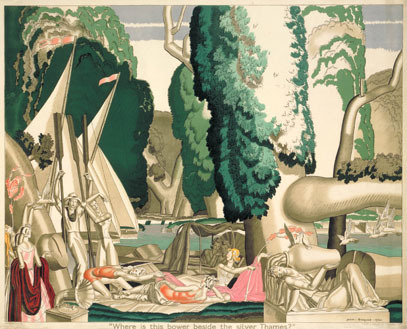 As the swoosh of skirts, flash of the fashion photographers lenses and clip-clop of heels rings around Somerset House, we are celebrating next week’s opening of London Fashion Week with Jean Dupas’s 1930 poster Where is this bower beside the Silver Thames?. Whilst todays fashion pack navigates the cobblestones of The Strand in six-inch stilettos, Dupas depicted Art Deco dames lounging beside the river Thames. Not unlike the street style blogs that capture the fashion frenzy that peppers the streets of London from September 13th to 17th, Dupas creates a poster which mimics the editorial style of a magazine shoot and combines it with a more natural and authentic surrounding. Dupas’ style was based on the new precepts of Cubism, creating surreal, idealised landscapes. He won the Prix de Rome (a scholarship for art students) in 1910 and spent two years in Italy where he painted Les Pigeons Blanc. This final painting from his time in Rome was presented at the Salon des Artistes Français (an association of sculptors and artists that holds a yearly exhibition) in 1922 where it received a gold medal and was thought to be the work that established his reputation as a painter. In 1925, he participated in the Grand Exposition Internationale des Arts Décoratifs et Industriels Modernes in Paris, one of the most heralded exhibitions of all time. Dupas exhibited Les Perruches and, whilst not one of his more famous paintings, it is considered one of the most defining of his career and the Art Deco movement. Steeply the thickets to his floods decline. This section could have inspired Dupas’ depiction of elongated female, model-esque figures (Straight trees in every place…) in long gowns (…trail their foliage fine…), which in turn evokes the feel of models on the set of a fashion shoot. This reflects what was happening around the time the poster was produced. Dupas designed posters for the Underground Group and London Transport from 1930-1933, a time when cheaper fabrics such as rayon and the availability of ready-made clothing meant fashion was no longer the privilege of the upper classes. Advertisers were putting more effort into appealing to this expanding female market that were interested and involved in fashion. This is when the adoption of the fashion plate style that Dupas’ poster reflects began, showing stylish women in sumptuous clothing that female consumers would, hopefully, want to emulate. This was also a time when newspapers were dedicating more space to fashion news and events and magazines devoted solely to the topic of fashion were widely available. Dupas depiction of these statuesque women posing in a completely contrasted natural environment is reflective of the current evolution of street style and the spectacle that is Fashion Week. Capturing the beauty of the subject and their distinction from their surrounds is a subtle feature in this particular poster and one that will not go unnoticed next week as the fashion world saunters from show to show.